Tag - farm | Squackle.com! The Funniest Site on the Net! Deiland is a fantastic game. Think 3D Harvest Moon in space, or a more timely analogy, Stardew Valley in space. Though, not as complex or farm-focused as these titles, Deiland takes a more streamlined and narrative approach to the farming sandbox genre. 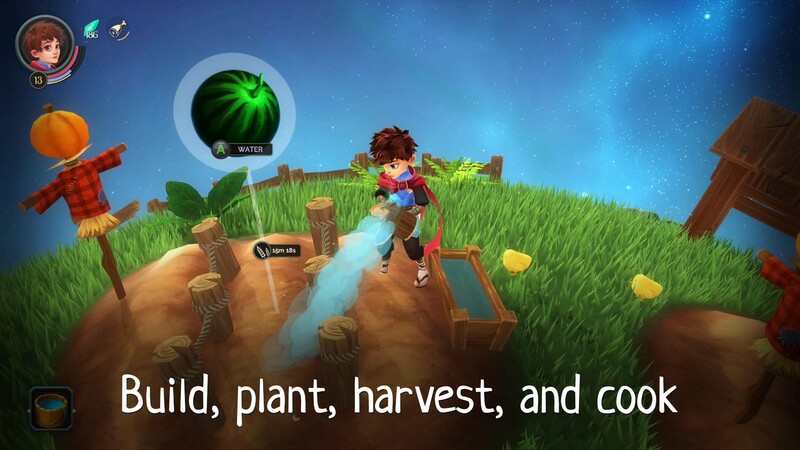 An extremely charming and interesting game unfolds as you perform your typical farming/crafting tasks. The basics of the game are pretty easy to grasp. You have three plots of land to plant food. You plant trees to cut them down and gather wood. You hit rocks and get stones. You use these resources to build. Where it gets interesting is that there is actually not that much to worry about when it comes to how to build your farm, or what things to plant, or where to put things. You can certainly pay attention to those things, but the way the game treats them is much more in the guise of “accomplish these quests/tasks” rather than the “customize it and make it look good” thing that most titles in this genre emphasize. There is a greater sense of purpose in doing the “normal sandbox tasks” that you see yourself doing. 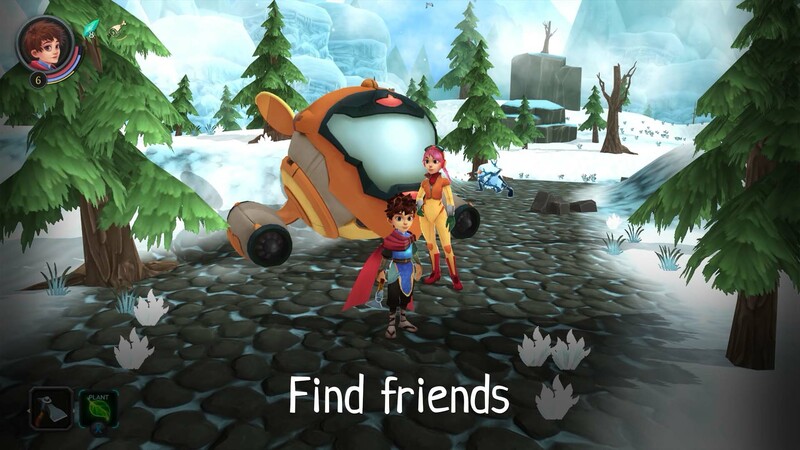 You’ll meet around ten different visitors/friends to do quests for, making you figure out how to use the tools you have been given in pursuit of completing them. Nearly every quest teaches you a new item to craft, and as you gather more materials, you’ll learn more about the visitors themselves. Since they actually “visit” your planet at random times, they can also overlap, which allows them to interact with one another; this gives the little planet of Deiland a much more communal feel to it. 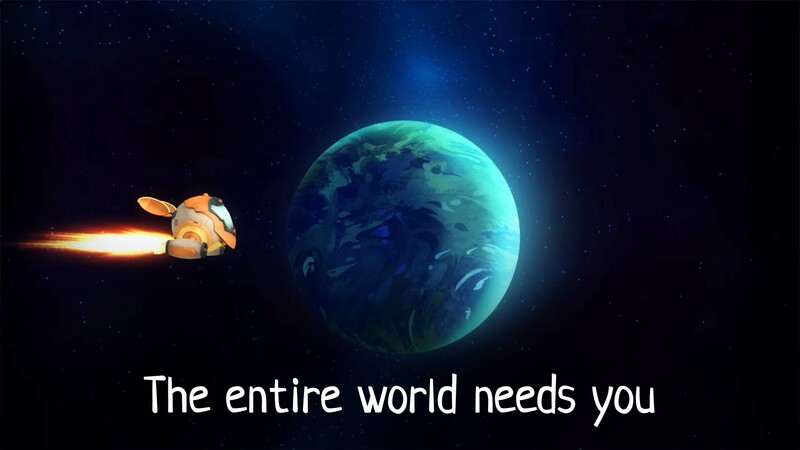 You’ll also visit a couple of different locations off the planet, such as another planet called Ankora, so it gives the game a bigger feeling; though you’ll feel homesick for the quaint life of farming carrots in short order. By far the most unique aspect is the planet of Deiland itself. Your entire planet is your “farm.” The planet is also very small and you can run around it in less than a minute. You have all of your normal sandbox features, such as a mine, plots of land to plant food in, and a lake to fish in. There’s plenty of empty space to plant as many trees/bushes as you like. Your house is upgraded to include more types of items to craft, along with upgrading your tools. All of the upgrading and new crafting items occur through the story, so as you progress through quests, your planet will develop further. Meteorites will hit the planet as well, creating a mini-game where you have to rotate your planet so that the meteorites don’t hit anything valuable, or they will get destroyed. 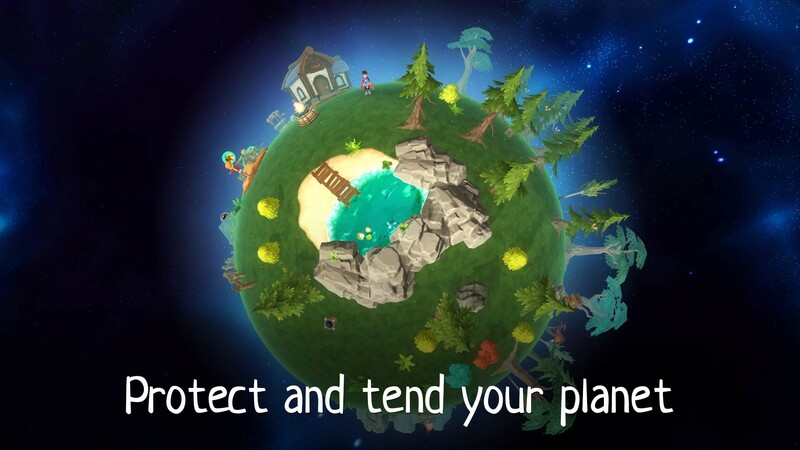 When it rains you can also rotate your planet or the clouds themselves over your plants to make them produce faster. A much appreciated quality of life inclusion is contextual actions. For example, if you go over to a tree, you will immediately use your axe to cut it; same with stones, you will immediately use your hammer to hit them. There is much less fumbling around with selecting tools than in Stardew Valley, and for this reason alone I generally enjoy playing Deiland more, which is a pretty big compliment. Why this wasn’t an obvious design choice in other games, I can’t answer, but I really do like it. While most of the quests can be completed by creating something on your farm, you can also buy your way through many of the quests by trading with the different visitors. Each visitor will buy particular things at a higher price, so it is good to wait to sell certain things until you visit a particular character. The characters themselves are all interesting in their own way, and about half of them don’t actually have models — they are just character art hiding inside of their spaceship or a building. This isn’t a big deal for me, but it would have been nice to see all of them have their own models and give more personality to the characters you befriend. 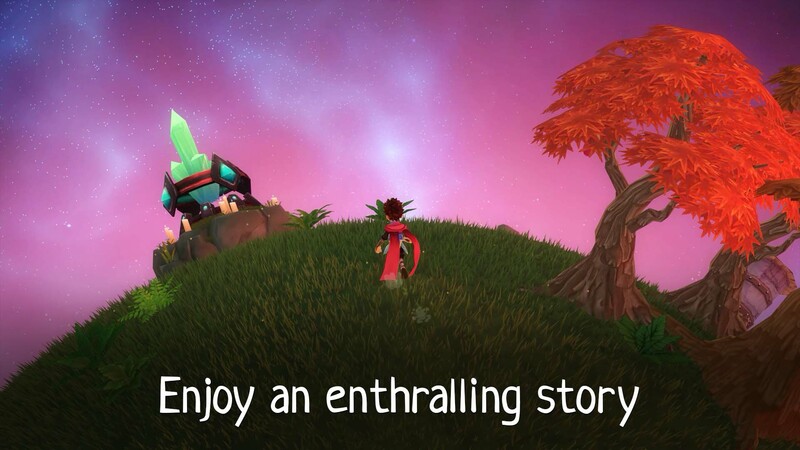 The mystery of the player’s character, Arco, is slowly unfurled as you progress through the storyline. You find several pages of the Prince’s “story” which alludes to the main villain. The story is a bit dark, with an unknown entity communicating to Arco through his dreams, saying creepy things. You also learn about previous “Princes” and the fact that your best friend, Mun, may have ulterior motives. It took about 10 hours for me to complete the main story, but unfortunately the ending is a bit sudden and you don’t expect it to be the end. Supposedly, there is free DLC planned for December, which gives at least some hope that the story is planned on being concluded in a satisfying way. As far as the bad things about the game, there isn’t too many, but there is some obviously underdeveloped aspects. It would have been nice to have a couple more buildings to build on your planet. After upgrading your house and building the barn there isn’t very much to invest your most common resources, Wood and Stone, into. 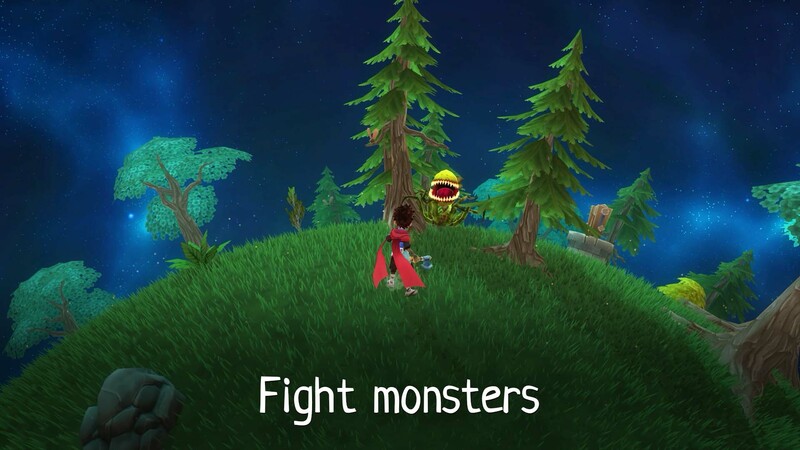 The fighting system is also pretty barebones, as your character basically only has one attack animation. Having to kill enemies feels more like a chore than something fun. Additionally, a few substantial ability unlocks occur at the end of the game, at which point you’re pretty much done playing, so new magic spells, for instance, have very low use. For some reason you’re also not allowed to even use magic in the “boss stage” which doesn’t make much sense. If you aren’t going to use it then, when would you want to use it? Not that this is required, but there isn’t any sort of “endless dungeon” or meaningful combat progression system, so there’s not as much emphasis on the combat aspects despite being something you have to do a lot. I’m really looking forward to seeing the game’s story conclude with whatever free DLC is being planned. While I’m not a fan of releasing unfinished games, Deiland is far from being unfinished — there’s plenty to do and I had a lot of fun for the time I put into it. It would have been nice to at least know that something more was coming immediately rather than having to research online about it. Deiland is can be purchased on Steam. The vagrant washes up for dinner and meets the family downstairs. Sitting at the dinner table are the farmer, his wife, their son, and a gigantic pig who is sitting at the table like a human. Throughout the meal the vagrant tries not to stare at the pig, who sports three medals around his neck, as well as a wooden leg. Bill’s barn burned down, and his wife Polly called the insurance company. Denice, Clemintine, and Momma are living on a farm full of raw sewage. Rivers of sewage flow through there large farm. Momma came out to the mud fields where Denice was digging. It seemed unsuccessful. “The plants aren’t growing Mum,” blurted Denice! “Did you use seeds,” asked Denice. A truck pulled up. It was Poppa! He was holding five hundred dollars! Momma started a yellin! Clemintine comes back with a fishing rod. and a pair of old boots. They look really burnt up and dirty. “All I could fish out of the sewer today was these boots,” stated Clemintine. They decided to go on a slide. They dug up a sewer pipe, cut it open, and jumped in. Afterwards they went a watched the sewage burn tires into a liquid!